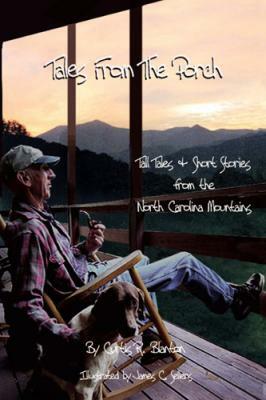 Tales from the Porch is the first book written by Curtis R. Blanton. Curtis was born and grew up in the most scenic of the North Carolina Mountains, much of which can now be seen from the Blue Ridge Parkway. Millions who have driven the Parkway, stopping frequently at breathtaking overlooks into Jackson County, have no doubt wondered how mountaineers were able to interact and convey information in those remote valleys below. The author takes the reader back to a time when communication was primarily by word of mouth, when news was passed from hill to dale and mountain top to mountain top, when storytelling was entertainment and when tellers of tall tales were welcomed entertainers on porches and community store benches. "Blanton will keep you rolling in laughter with homespun humor but at the same time will teach you a lot of backwoods philosophy....Those who buy the book will learn apleanty about growing up here. About things like wampuscats, fire-and-brimstone sermons, thumb-sucking mules, draft dodgers, black snow and walking girls home from chruch. That was a treat! Made you feel good all week."